This year’s symposium focused on the technical, compositional and performance issues surrounding multi-channel audio, and featured paper presentations and concert hall performances/presentations of multi-channel works. The events were complemented with an ongoing installation for improvisational performance, run by students in Concordia's Electroacoustic Studies program. This paper considers three compositional approaches for multi-channel spatialization, termed “polychoral”, “sculptural”, and “sonification”. Each strategy is oriented towards embodying the individual loudspeakers as musical presences, rather than dematerializing them in a simulated ambience. In this tutorial, pseudo-stereo techniques used to give “volume” to a monophonic sound over conventional two-channel stereophonic systems are reviewed and then conceptually extended to multichannel systems for electroacoustic music composition. The applications are illustrated as Pure-Data Do-It-Yourself examples. Many Real-time/performed electroacoustic music of the recent past can hardly be performed today because the technologies used have gone lost since a long time and no long-standing notational precaution was taken. This paper presents some typical case studies and examples and introduces some techniques that might lead to a partial when not completely adequate solution to the sustainability problem. Nearly 50 papers presented at the 2004 edition of the conference, covering a broad range of topics — Programming, Improvisation, Perception, Physical Modelling, etc. — are available on the SCM04 site. Some thoughts on, and a basic introduction to some of the issues around the history and production of electroacoustics. Contemporary combat films focus on the maturation of feminized boys into masculine heroes through war-soldiers who “do the right thing” when faced with moral dilemmas no matter what their orders. Sound and timbral development plays a crucial role in the film Black Hawk Down towards defining, substantiating and sustaining these thematics. Analogous sonic thematics, and their timbral development, are shown in analysis of scenes from the film. Excerpts of a talk given at The Banff Centre by Fernandes, discussing emerging trends in audio as they deal with loudness concerns in film and TV post-production. Article discussing noise level measurements and sonic observations gathered and compiled in the Fall and Winter of 2003 at this Montréal movie theatre. The work also included recordings of both public and behind-the-scenes areas of the theatre, showing the effects of numerous powerful theatre sound systems. In a globalized world, it is often difficult for critique to stand fully apart from its object, and often critique becomes implicated in its own sweep. The author examines the notion of implicated critique as it is embodied in some of his recent compositional work. This article describes a number of extensions to digital waveguide synthesis, along with the compositional motivation for each technique. Extensions include unconventional excitation functions, variations on section and network configurations, peak-limiting strategies, and multichannel spatialization techniques. 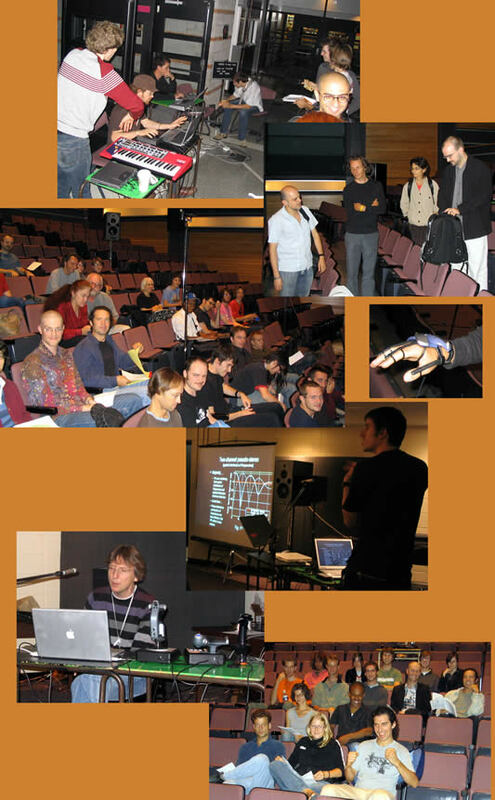 Overview of the Oscillations festival (Wolfville NS, 18–20 November 2005), which featured special guest artist Robert Normandeau. An ear-witness account of the ÉuCuE series XXIV Concert 13. This event, curated by Dominique Bassal, featured compositions mastered for Electroacoustic performance. SONUS: Kevin Austin reviews recent works added to the CEC’s internet-based electroacoustic “Jukebox”.